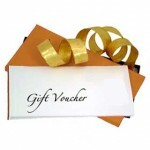 Looking for something different to give this Christmas? Take a look at our girlie sewing day gift idea! 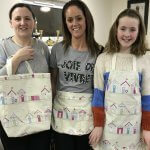 Cath Walsh, a previous student bought her nieces a girlie sewing day as a gift. The girls attended just recently and had a really fun day, learning new skills. With experience ranging from ‘never sewn before’ to ‘did a little in school years ago’ this cute little cookery apron was the perfect choice for all. Look what we made on our girlie sewing day! 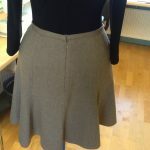 It wasn’t long before the girls were using sewing terminology naturally, ‘sewing 5/8”seams’, ‘pressing’ rather than ironing, sewing perfectly ‘mitred’ corners and a ‘box pleated trim’ to finish! 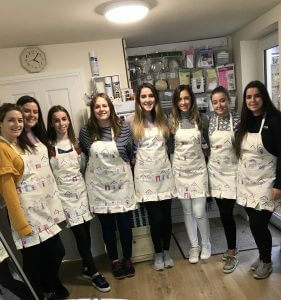 Clare, Isobel, Laura, Lucy, Maddie, Rachel, Sarah and Stephanie worked really hard, even on some of the more challenging steps and completed their aprons ahead of time. Well done girls! 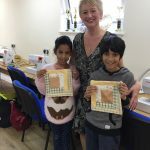 Hi Janet – just wanted to say a big thank you for yesterday, the girls loved their day and said it was such a great present. They were also so so impressed with you- your patience, your skills and your organisation. I knew they’d love you and the day once they organised their diaries to actually do it! They thought it was a great idea as a present, so maybe you should promote it as an option with Christmas looming? 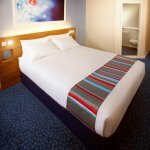 it’s great to get such positive feedback, so why not act on it? So if you have friends in mind with whom you’d like to share a new adventure or simply want to buy a class or course for a friend, see our Christmas gift ideas link. We have lots of options to choose from to suit all pockets.